The Island of Oahu is full of breathtaking views, and there are so many ways to experience them! Oahu has so much to offer, and we are here to guide you to all the best spots to take it all in. Discover a one-of-a-kind experience and make memories that will last a lifetime on one of our zipline tours and at the many other places here on the Island. To help you plan for your trip, here are some of the top attractions in Oahu with the best scenic views. For constant panoramic ocean and mountain views of Oahu’s famous North Shore, pay us a visit at CLIMB Works Keana Farms! You’ll start your tour with a 2-mile ATV ride to the top of the mountain. Along the way, you’ll go by farms and through the jungle, seeing all the different inland landscapes of Hawaii. The zipline tour itself is 3 hours long and includes 2 rappels, 3 sky bridges, and other unique surprises! Our ziplines start at about 410 feet about sea level and offer a bird’s eye view for you to see the beautiful beaches, farms, and lush mountains. Keana Farms produces over a million pounds of produce every year, and you can explore and learn about this farm while soaring over it during your zipline tour! If you love turtles, this attraction in Oahu is the place to go! Laniakea Beach is also affectionately known as “Turtle Beach” because of the green sea turtles that can often be found basking in the sun here. These adorable sea creatures tend to flock here because of the abundance of bright, green algae. The gorgeous ocean views combined with the surrounding plants and trees are just a few more things that make this beach so beautiful. 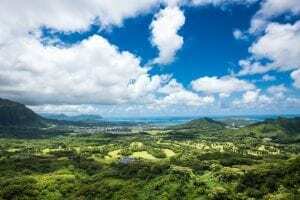 Nu’uanu Pali Lookout, AKA Pali Lookout, offers breathtaking views of Oahu’s windward side, where you can spot the gorgeous Kaneohe Bay, and the town of Kailua. It truly is one of the most scenic places in Oahu, so you’ll definitely want to bring your phone or camera to take a few pictures. You’ll also want to wear a jacket because this lookout is also known for its strong winds! If you’re looking for scenic views and a chance to reconnect with nature, take a hike to Manoa Falls! The 150-foot waterfall located along the trail is guaranteed to amaze and makes for a picture-perfect backdrop. This 1.6-mile trail is also relatively easy in difficulty, making it a great choice for all skill levels. It winds through the Hawaiian tropical rainforest where scenes from Jurassic Park and LOST were filmed! This trail is also dog friendly, so you and your furry friend can enjoy it together. Now that you know where to go for all the best views, it’s time to start planning your trip! Make your visit to Oahu unforgettable, and book a zipline tour with us. We look forward to seeing you at CLIMB Works Keana Farms!